Chase and Company (Sanford, Fla.
An original letter of correspondence between brothers and business partners Joshua Coffin Chase and Sydney Octavius Chase. Topics discussed in the letter include Honorable J. G. Bright's rejection of claims for abatement of the Isleworth Grove Company and C. C. Teague's and the California Fruit Growers Exchange's experience making abatement claims. 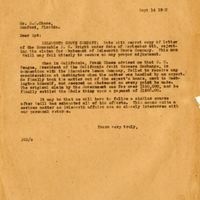 Original letter from Joshua Coffin Chase to Sydney Octavius Chase, September 14, 1923: box 49, folder 20.84, Chase Collection (MS 14), Special and Area Studies Collections, George A. Smathers Libraries, University of Florida, Gainesville, Florida. Digital reproduction of original letter from Joshua Coffin Chase to Sydney Octavius Chase, September 14, 1923. ISLEWORTH GROVE COMPANY: Note with regret copy of letter of the Honorable J G. Bright under date of September 4th, rejecting the claims for batement of Isleworth Grove Company. This man Weill may fail utterly to secure us any proper adjustment. When in California, Frank Chase advised me that C. C. Teague, President of the California Fruit Growers Exchange, in connection with the Limoniere Lemon Company, failed to receive any consideration at Washington when the matter was handled by an expert. He finally took the matter out of the expert's hands, went to Washington himself, and secured an abatement on every point he made. The original claim by the Government was or over $100,000, and he finally settled the whole thing upon a payment of $1500.00. It may be that we will have to follow a similar course after Weill has exhausted all of his efforts. This means quite a serious matter as Isleworth affairs are so closely interwoven with our personal returns. Chase, Joshua Coffin. 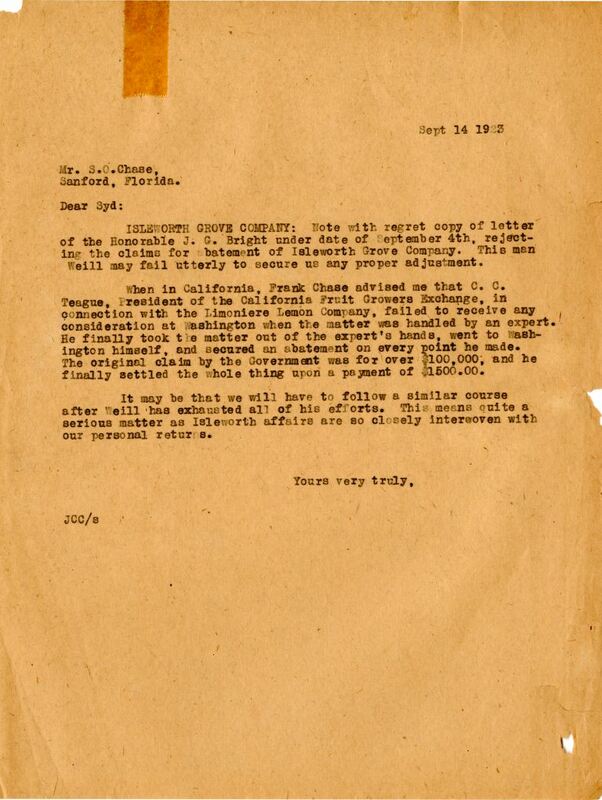 “Letter from Joshua Coffin Chase to Sydney Octavius Chase (September 14, 1923).” RICHES of Central Florida accessed April 21, 2019, https://richesmi.cah.ucf.edu/omeka/items/show/2744.